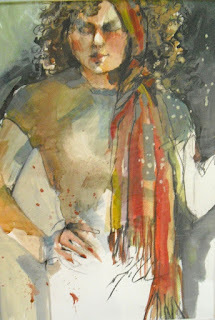 We had Gloria for our model today, will use her on Friday for my workshop...she's inspiring. this is a small commission I finished today, not my usual thing, but fun anyway. On this demonstration I was showing them a method of layering paper upon paper and painting and drawing at the same time. It often confuses the viewer, who cannot tell what media it is. 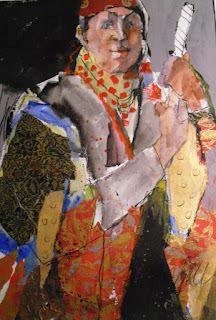 This is a true mixed media, again on paper. I had a wonderful time with this group, they did some great work and gave me many good laughs. Think they are all very talented and willing to try anything. I visited the Sugarland Art League yeterday, meeting at UofH building. I did a demo for them of my process and this was the result. They wanted me to do a workshop for them next February and I agreed. They were a nice bunch of people, saw old friend Sharon Satterwhite, as well as Holly Hunter Berry, a talented artist in Sugarland. 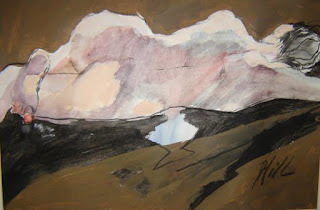 She has agreed to do classes at the Watercolor Society, which is going to be quite a treat for them. May take it myself. 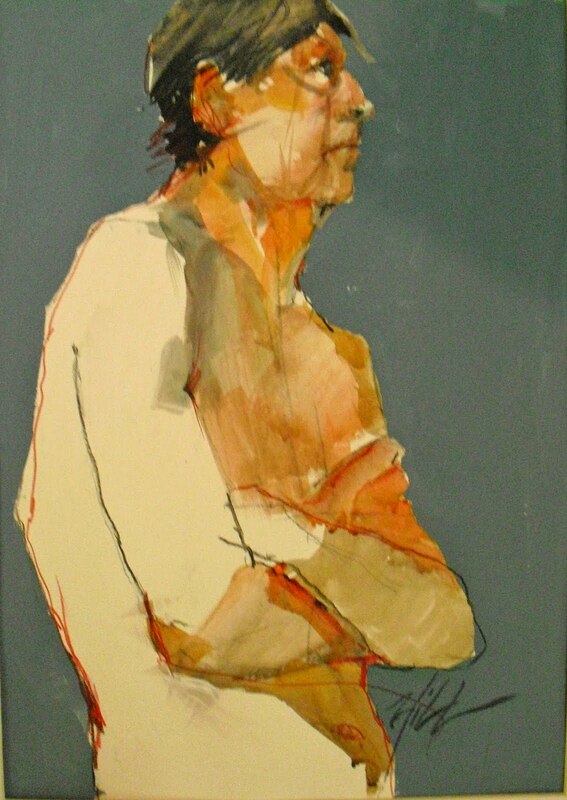 Learned today that this piece received the juror's award in this show. It was last month, and got it back today with the exhibit brochure. The judge was Judy Coffey who is a wonder ful artist, and I am very honored. 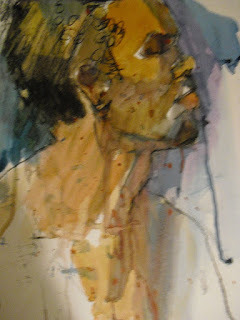 Model named Pete at the watercolor society yesterday. He was fun to draw and this is probably my best . Put the background on at home today and added a few red lines. As I am such a linear artist, I love the lines. We had a beautiful artist/model last Thursday nite. This is strictly watercolor, done mainly with direct observation of the model. Hung new show at Archway yesterday. 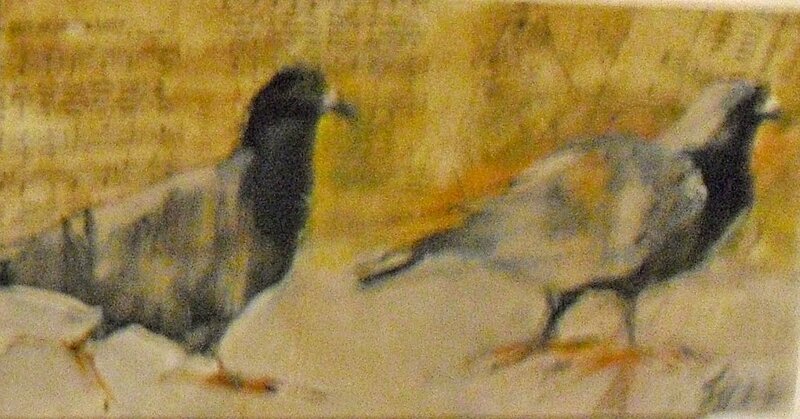 Included these pigeons, they are small, 6 x 10". The process was interesting. 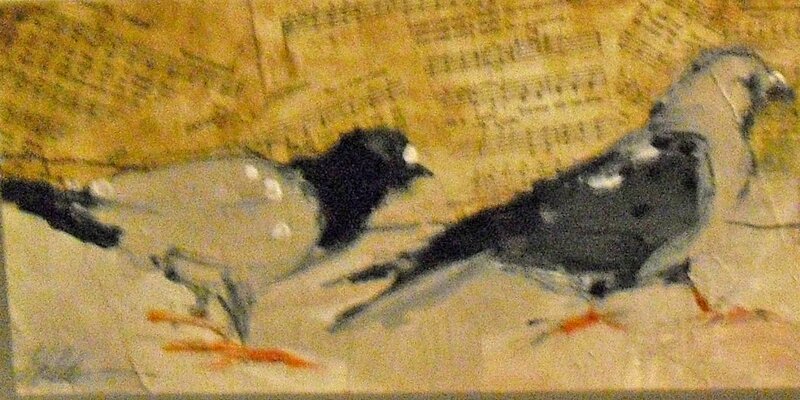 The background is antique hymnal pages, stained with coffee and applied to the surface. I then painted the pigeons on top of the background. I call them "Praise Session 1" and Praise Session 2". June will be my last with Archway, prefer to move on to other things. Wish me luck.